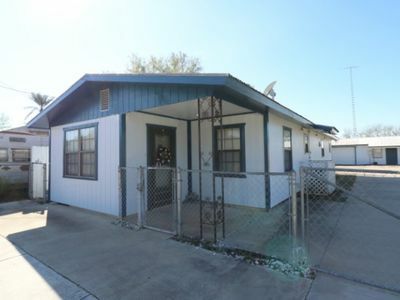 Oversized fenced lot, backs to government land and features two living quarters – 2BR/1BA main house + 1BR/1BA detached casita. Each lease separately or can rent together. Custom wood siding main home with fresh exterior and interior paint, metal roof, kitchen with island, updated bath with spacious ceramic tile walk-in shower, laminate wood and ceramic tile floors. Detached casita with cozy living and kitchen. 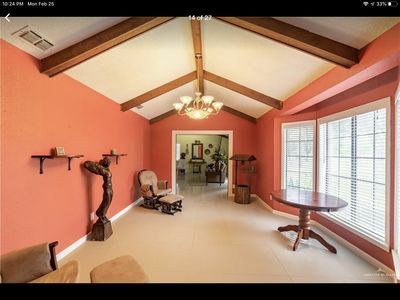 Huge detached metal garage, attached covered carport / patio. Covered pergola – perfect to sit out and enjoy the breeze. Serene country setting, great to unwind. Owned by Bassmaster Classic Champion Alton Jones, Falcon 1 cabin is a cozy cabin that caters to anglers traveling to Falcon Lake. (Have a larger group? See the note ** at the bottom of this description) . The bedroom contains 1 King bed and 3 twin beds. 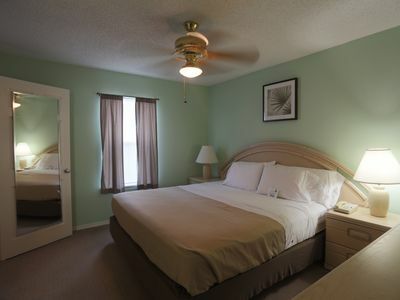 It features a fully equipped kitchen, washer & dryer, high-speed internet, 2 HD Tv's (125 channels). 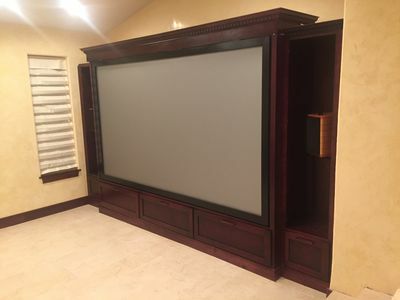 TVs are located in the living room and bedroom. Fantastic central A/C and heat, 12 outdoor electrical outlets for charging, fenced and gated with a huge concrete parking area that can accommodate 4+ boats and trucks! There is a covered carport too. We even have outdoor picnic tables. Alton knows what fishermen need when looking for a place to stay and he's made sure this property has it all. Located just a few blocks from the boat ramp at Lakefront Lodge, this is simply the best fishing setup on Falcon Lake! What's so special about this property? After 26 years of towing my boat to tournaments all across the country, I know how hard it is to find the perfect place to stay on a fishing trip. But when I found this property I knew I had something special. Here's why: #1 - Security: You need a safe and secure place for your boat, truck, and equipment. Our property is FENCED and GATED and we have a giant concrete pad with enough parking for more than 4 boats and trucks. There are gates on both ends of the concrete so you can pull in through 1 gate and pull out through the other. But if you need to turn around there's plenty of room for that as well. Cabin doors are equiped with electronic dead-bolts to help secure you and your belongings, and to give you keyless access for a hastle-free experience. #2 - Clean & Comfortable: We take pride in keeping this property professionally cleaned and updated. The furniture is nice and the beds are comfortable. South Texas can be hot - really hot, so we have an over-sized A/C unit that will keep it cool inside no matter what the outside weather conditions are. #3 - Affordable: This is a very nice property, but won't break the budget. #4 - Convenient Location: We are located about 2 minutes away from the nearest boat ramp and about 6 minutes from town. ** Have a larger group? Consider renting both Falcon 1 and Falcon 2. They are side by side and together they can accommodate up to 8 guests. Falcon 2 Cabin - FENCED & GATED to protect your boats & vehicles! Owned by Bassmaster Classic Champion Alton Jones, this cabin has 1 queen bed and 1 twin bed. The A/C and heat work great and will ensure your comfort. It has high-speed internet and HD TV with 125 channels. (Need more room? Please see ** note at the end of this description). There is a mini-fridge, microwave oven, gas grill, and a covered picnic table (outside). We have multiple outdoor electrical outlets for charging your boat(s). The best part is the huge CONCRETE parking area that can easily accommodate multiple boats and trucks. All of this is fenced and gated to keep you and your equipment secure. What's so special about this property? After 26 years of towing my boat to tournaments all across the country, I know how hard it is to find the perfect place to stay on a fishing trip. But when I found this property I knew I had something special. Here's why: #1 - Security: You need a safe and secure place for your boat, truck, and equipment. Our property is FENCED and GATED and we have a giant concrete pad with enough parking for more than 4 boats and trucks. There are gates on both ends of the concrete so you can pull in through 1 gate and pull out through the other. But if you need to turn around there's plenty of room for that as well. Cabin doors are equiped with electronic dead-bolts to help secure you and your belongings, and to give you keyless access for a hastle-free experience. #2 - Clean & Comfortable: We take pride in keeping this property professionally cleaned and updated. The furniture is nice and the beds are comfortable. South Texas can be hot - really hot, so we have a terrific A/C unit that will keep it cool inside no matter what the outside weather conditions are. #3 - Affordable: This is a very nice property, but won't break the budget. #4 - Convenient Location: We are located about 2 minutes away from the nearest boat ramp ( Lakefront Lodge ramp) and about 6 minutes from town. ** Have a larger group? Consider renting both Falcon 1 and Falcon 2. They are side by side and together they can easily accommodate 8 guests. The ultimate fishing cabin. This is the place to spend your nights recovering from reeling in the biggest fish you will catch in your lifetime. Located on the water, this gives you the ability to sit on the back porch and relax while drinking a glass of ice tea, and being just walking distance away from the best fishing in the country. Falcon lake is a great location to focus on fishing and spend the evenings enjoying the comforts of this home away from home. 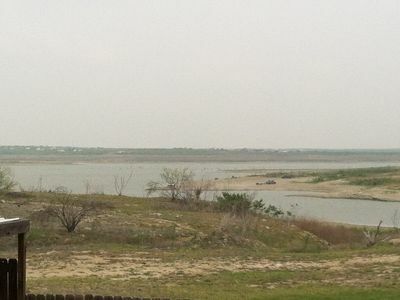 Lake Level is up - fish are on the move…BASSMANS LODGING are Lake View veteran owned vacation rentals located at Falcon Lake, Zapata Texas. Read my reviews, you wont be disappointment and If we are booked for the days you require please look up my website. PLEASE NOTE: for faster reply, add your phone number to the message you send as this site will not allow me to contact you without booking,otherwise please check back after submitting a question. I usually reply back within minutes. We offer an Affordable, Clean, and Secure lodging. *HEROES Discount ( Teachers, Military, Police and Fire Personnel) Discounts *Free lake ½ Day Lake orientation *Private boat ramp that guarantees you’ll be on the water in no time. *Located 10 Min from the county boat ramp. Our 1000 square foot home was remodeled in 2014. It is a gated single story home with three bedrooms that includes 3 full size and 2 twin beds, two baths that will comfortably sleeps 6+. 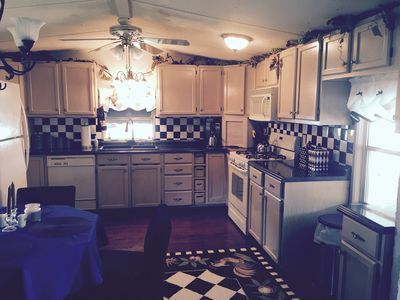 The distinctive beauty and charm of this manufactured home sets it apart from the rest. If the dates you’re looking for are booked please contact me as other properties are available. Are you thinking of fishing 2 weekends in a row or pre-fishing a weekend before tournament, but don’t want to tow your boat back home? 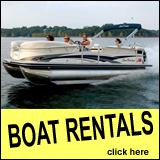 Arrangements can be made to store your boat at our adjacent lot with 24hr parking lot video surveillance. The home also has an attached carport that is perfect for parking your boat in the shade and retying your lures; relax and tell the story of that one that got away or enjoy your favorite beverage while watching the sunrise or sunset while having a cookout. To reserve, visit our web site or email me the dates you wish to reserve! This lodge is sure to book fast. So don’t delay! 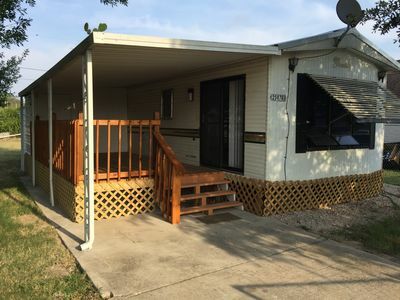 Cabin is located walking distance from the Falcon lake water, it is a spacious two bedroom, two bath that sits in the nicest and most prestigious neighborhood in Zapata! it is strategically located to have immediate access to almost every thing in Zapata, public Boat ramp is .9 miles away, restaurants are as close as .75 miles away, the cabins is beautiful, recently remodel, with new furniture and appliances which include, 5 full beds, one queen bed, one good quality folding bed, sectional living room set, 42" smart TV in living area, dining table(sits six) stove,refrigerator, coffee pot,toaster, blender,washer and dryer,iron and ironing board, all utensils in the kitchen, plates,forks,spoons,knifes,cutting board,drinking glasses, cups etc. 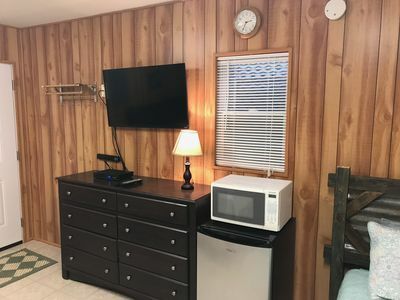 The two bedrooms are furnish with one queen bed and smart TV, in the smaller bedroom, and 5 full beds, smart TV, a office desk (WIFI internet) in the larger one! both the bath rooms are full baths! on the outside we have a front porch with a beautiful view of falcon lake specially during sunset, in the porch we have two park benches that can be utilized to refresh and enjoy the beautiful falcon lake evenings! As of parking for trucks and boats we have plenty of, we can accommodate five trucks with boats on covered parking, at which we have power outlets for each individual boat parked! we also have a BBQ grill in case you decide to cook off! I wish I could be more specific and really give you the full picture, but I'm confident that if you try it you will not regret it!! 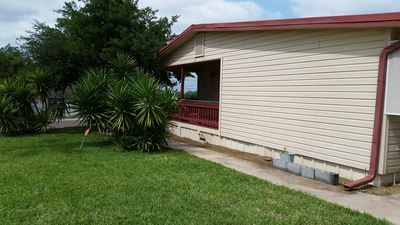 A Cozy and comfortable one bedroom one bathroom guest house with a back yard is available to spend your vacation in this border town Laredo. This house is business ready and all the rooms are equipped with appliances and furniture that are needed for your stay. Bed room has a walk in closet that could accommodate all your luggage and clothes for a longer stay. And has a comfortable queen bed accompanied by a dresser, mirror, night stand and night lamp makes it very inviting to rest after a long day of work, travel, or shopping. There are extra twin mattresses available for additional guests. It also has a student desk and chair for your to do your work or business from home with your laptop Living room is furnished with sofa and chase which can put together as a full bed for an additional guest. It also has 55 inch flat screen TV that gives access to local cable channels, and Netflix. There is also free WiFi available. Kitchen and dinning is furnished with appliances such as Refrigerator, stove, microwave, coffee machine, toaster, cooking pots, pans, plates, some common spices, coffee, tea, sugar, creamer etc. there is dinning table and four chairs for a family of four. 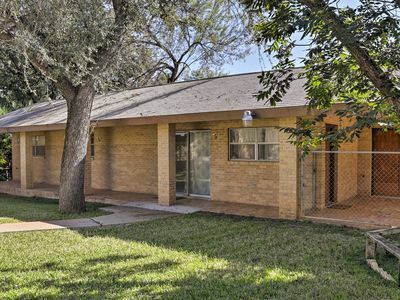 This house is centrally located to all restaurants, shopping centers, Laredo medical center, and Mexico Border gate, down town museum and mall. It is five minutes away from the Casa Blanca park, Laredo International Airport and the local Bus station located in down town for your convenience. There are bus stops every 2 blocks to get around Laredo. Most of the fast food restaurants, like subway, Mc Donald s, Taco Palenque, Pizza hut, Popeye's, Lin's Buffet, China Bowl all few blocks walking distance from the house. There is wal greens, HEB grocery store 4 blocks from the house. Everything you need to shop or eat is around 2 miles radius to the house. The Rustic Home II, exceeding your expectations, not your budget! Find your home away from home in our beautiful two-story 1440 sq. 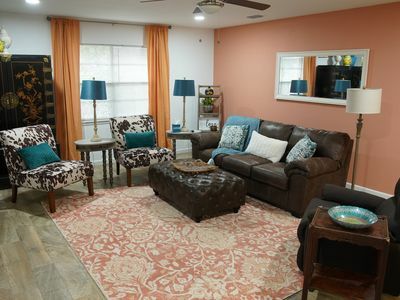 ft. high end condominium furnished and decorated with one-of-a-kind Mexican Rustic Hacienda style pieces by THE RUSTIC GALLERY in San Antonio TX. 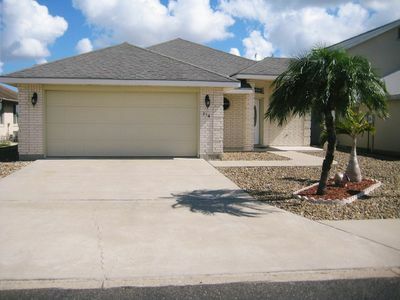 Our home is fully equippped , has a private patio, large community pool and two assigned parking spaces. 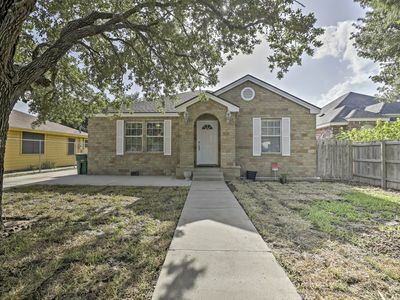 It is in a superb location two blocks from IH35 and Del Mar Blvd, a block from HEB, Target, Best Buy, minutes from Mall Del Norte and five minutes from Texas A&M International University (TAMIU). The condominium has a large living and dining room area, spacious master bedroom with a king size bed a large couch and en-suite master bathroomm, second bedroom has two double beds and it's own full bathroom. Kitchen is fully equipped and there's a half bathroom with a washer/dryer. The Rustic Home, exceeding your expectations, not your budget. Beautiful 1440 sq. 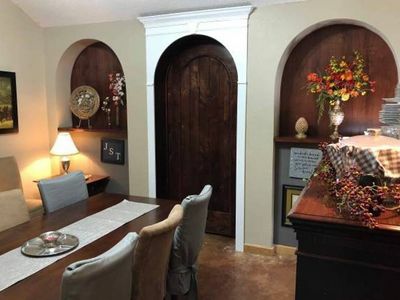 ft. two story condo furnished and decorated in one of a kind Mexican Rustic Hacienda style furniture by THE RUSTIC GALLERY in San Antonio Tx. Our home is fully equipped, large community swimming pool, easy access to Mall del Norte, blocks away from IH35 and HEB and Target. Master bedroom has a king size bed and a large master Bathroom, 2nd bedroom has a queen size bed, walk-in closet and its own bathroom. Large, spacious living and dining areas, half Bathroom with washer and dryer on the first floor and a furnished patio. Stay the winters in your RV on our shaded concrete lot. One block to the exclusive Martin Valley Ranches 27 hole golf course, 10,000 sq ft club house, exercise room, indoor/outdoor pool, hot tub, billiards, cable tv, kitchen, laundry faculties, underground utilities, lighted and paved streets. The sunny Rio Grande Valley of south Texas provides escape from the northern winters at a very affordable cost. 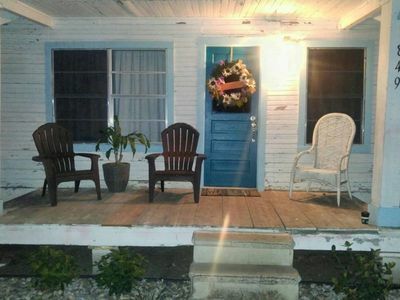 Casa de Renta por dia, por noche, por un fin de semana, o por un mes para irte de compras a McAllen o irte a la playa de South Padre Island, o simplemente para visitar algun familiar. Les esperamos con mucho gusto y agrado; estamos a 5 millas de las plazas De Shopping de McAllen y Mission Texas, como Las Tiendas De Sharyland y La Plaza Mal, y estamos cerca de El Cimarron Country Club de Mission TX. The house will be all yours for the booked days. You are responsible to keep it clean. The house is all yours for your needs; only you all will be using it. The house is 1 mile away from Seven Oaks Country Club, 3 miles away from Cimarron Country Club, 1 Mile away from Mission Hospital, 5 Miles away from: Sharyland Towne Crossing shopping center, Walmart, HEB, Bentsen State Park, and the National Butterfly Center. 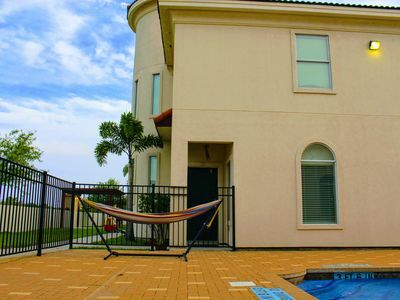 New 2 Story Luxury Townhouse near Shary Road minutes away from the McAllen Convention Center and Shopping area. Townhouse features an open flexible floor space minimalist decorative elements with soaring ceilings and a timeless simplicity. All Stainless Steel Appliances(stove, refrigerator, dishwasher and microwave). Includes washer and dry in unit. Private Patio surrounded by Royal & Foxtail Palm trees perfect for entertaining friends. Contemporary-Modern Luxury Townhouse feature an open flexible floor space minimalist decorative elements and extensive use of elegant contemporary or "industrial" mixed materials such as concrete vinyl porcelain and glass are used extensively throughout the home. Sophisticated Townhome design offers soaring ceilings and a timeless simplicity that works well for all individuals. Features a Fully Integrated Kitchen with Silverware, Glassware & All Stainless Steel Appliances (stove, refrigerator, dishwasher and microwave). Clean and sleek countertops and vanities made from Quartz. 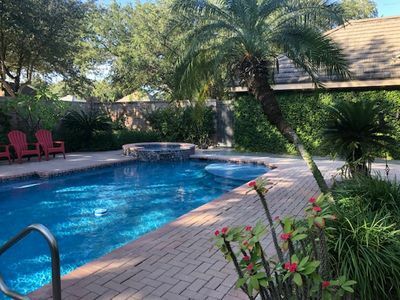 Includes: Wifi, TV, Washer & Dryer, Hand Soap, Toilet Paper, Fresh Clean Towels, Private Patio surrounded by Royal & Foxtail Palm trees perfect for entertaining friends. 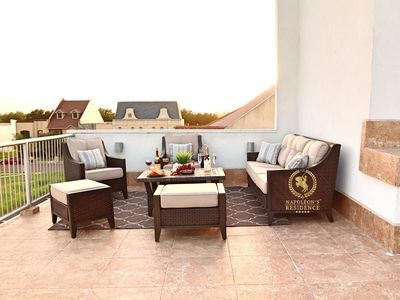 New outdoor furniture will be added this Feb 2019 as seen on pics. This is a fully-furnished property located in North McAllen, perfect for business travelers, families, couples and large groups. You will find the fully gourmet assembled kitchen that includes all of the silverware, glassware, and brand new appliances. 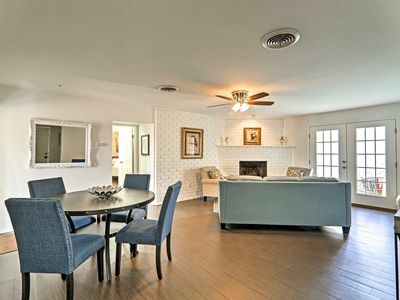 You will also find the beautiful dining room and living room areas! In addition to that, you will also find the uniquely romantic outdoor patio to celebrate any special occasion with that special someone! (?????) Any guest can reach out to me and message me at any time. I am available for all of my guests 24/7. When you rent your rooms, you are reserving a divided portion of my home, but the entire space is only for you and your group. Come and go as you please. Comfort and cozy awaits! Bedroom 1 has a Queen sized, memory foam mattress bed. Bedroom 2 has a Full sized, memory foam mattress bedRooms include high speed Wi-fi, large screen LED televisions with AppleTV. Alexa digital assistant enabled. FULL KITCHEN ACCESS is not provided. You have the entire living room and dining room at your disposal. Great locación. Ubicación perfecta. 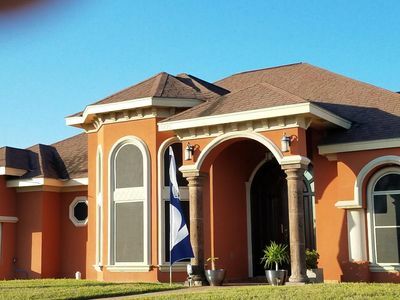 La casa ideal para llegar en McAllen!! Nuestra casa permite hasta 11 huéspedes. 6 en la casa principal en tres recámaras, y 5 en la extensión con costo extra. En la casa principal el área de cocina, sala, bar y comedor es amplia y bien equipada. TV en recámara, estancia y área de asadores. wifi. Netflix, Aire acondicionado, Jardin con alberca, terrazas y asador. Adicional a la casa principal hay una extensión con costo extra para 5 personas y consiste en una recámara con cama queen, una con cama twin y un baño completo compartido. Hay además una recámara master en primer piso con cama king y baño completo. Además hay un baño completo y un salón de juegos con shuffle board, mesa de ajedrez y tres pantallas de TV. Todo se puede rentar por separado . Toda la propiedad está unida por terrazas, alberca y asadores . No se permiten fiestas en la propiedad (si reuniones, pero por favor respeten el descanso de los vecinos). El precio que se anuncia aquí es de la casa principal con tres recamaras, Jardin, alberca, terrazas... como se ve en las fotografías.... Main house has an addition that can be rented for an extra cost. This has master suite, queen bedroom and twin bedroom sharing a bath. There is a standout party room with a spectacular bar that can be rented separately with the main house. This room has large flat screen tv, shuffle board, chess table and opens on to the pool and outdoor kitchen and 3 outdoor barbecues. No parties allowed in the property (reunions are fine, but please respect the neighbors). Our home provides an elegant, relaxing, and fun environment for you and your traveling group. It features a pool/spa, two home theater areas with high end a/v components, comfortable beds and furniture, a fully stocked kitchen with modern appliances, fitness equipment, and a tastefully designed interior. The interior features Venetian plaster throughout, porcelain tile floors, maple trim, recessed lighting, and carefully selected accents. Beautiful Upscale neighborhood, in the city but away from all the noise. 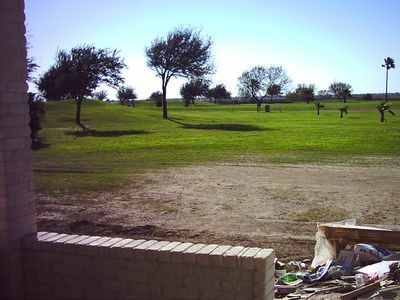 Beautiful scenery, golf disc park is literally right accross the street, also golf course on the main street closest to our home. A large variety of birds visit our property, also ducks from the lake at the disc golf park walk on over to visit. Dont be surprised if you see our neighbors beautiful peacocks walk on by or just prancing on the side of the road. Plenty of baby bunnies seen hoping at night too. Our place is a large living space with a full kitchen: Stove, Oven, Refrigerator, Dishes, Pans, Coffeepot etc. The large living room and dinning area is perfect to relax after a long day. The living area is large enough to provide space for the air mattresses for thise traveling with family or friends. (towels and linen provided plus toiletries) It has a private Queen Sized bedroom with a walk in closet, and a full bath with private poolside entrance. Steps from Sparkling Swimming Pool, TV, Cable, Wifi, coffee, etc. Its an upscale neighborhood, in the city, but yet away from the noise. You can see the beautiful stars and the moon at night. Fit for business travelers and or leisure. Private fenced in covered car port, enjoy access to the sparkling hamilton pool. The property has been very well maintained and has the feel of vacationing in the country with the benefits of the city. The open floor plan optimizes living space and maximizes the comfort for our guests. The kitchen bar has four comfortably solid mahogany stools with an hdtv for added comfort. There is a breakfast table located in the dinning area with four chairs. The formal dinning area has a beautiful large mahogany table that seats 8 comfortably. The master bedroom has a king bed with a wall mounted smart hdtv and stand up glass shower located in it's bathroom. The second bed room has a queen size bed with a wall mounted hdtv. The third bed room has a custom made bunk bed station with 4 twin size beds and a wall mounted smart hdtv. The fourth bed room room has a queen size bed and wall mounted HDTV. The entertainment room has a pool table, poker table, and set of rustic couches. There is also a half bath located in this room. The living room has a large wall mounted smart 3d HDTV, a beautiful peaceful sounding water fountain, and five of the most comfortable reclining leather oversized chairs you could sit on. The back yard is a continuation of the rustic theme with a beautiful brick open grill and wagon wheel chandelier, as well as the wood work along the entire back part of the house. There are two wooden tables with 8 chairs in the patio area. There is a remote controlled gate in the back that allows you to park two vehicles and additional parking in front of the house. 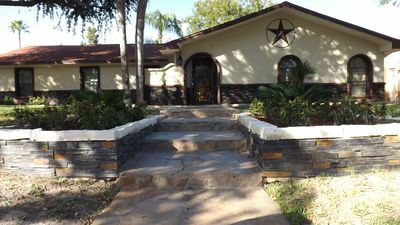 Overall this phenomenal rustic country themed dwelling is perfect for families of all sizes and/or corporate organizations looking for privacy and extreme comfort while staying in McAllen. Heart of McAllen. Newly Modern renovated space with a full kitchen, BBQ Pit, outdoor patio, Cable, TV, WIFI, DVDs, games. 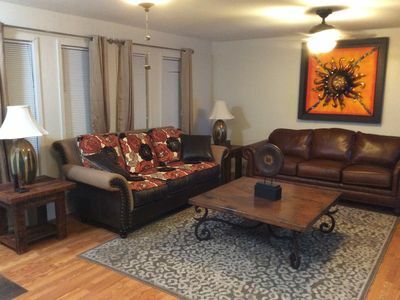 2 bedrooms with 3 real beds (1 queen, 2 twin beds) that sleeps 4, plus 1 air mattress if needed. Set up in a quiet and serene location with organic fruit trees. At walking distance to jogging trails, city park, public swimming pool, museum. 5 minutes from airport and La Plaza Mall, all very close. It is at walking dstance to the Games of Texas and to the annual Christmas Parade. Why pay the high price of a hotel. Come stay in our master studio. NOW EQUIPPED WITH MINI KITCHEN! 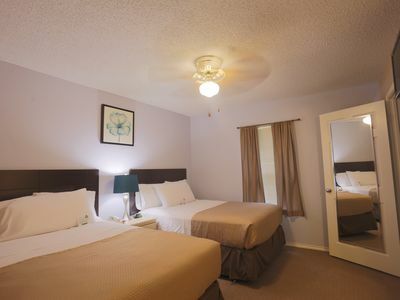 You will have your own parking spot (curb side) with your own private entrance, private patio, internet, cable TV, clean linen ( hypoallergenic covers on our bed and pillows are disinfected after each guest), king size memory foam bed, with private bath and mini kitchen. WE OFFER WEEKLY AND MONTHLY RATES This place is perfect for professional's and traveling Nurses!!! Private Master Suite bedroom with private french door entrance that is perfect for a couple, small family or a professional traveler. It has a private patio area where you can sit and enjoy the fresh air or watch the moon from. Entire Master Suite is yours, no shared areas. 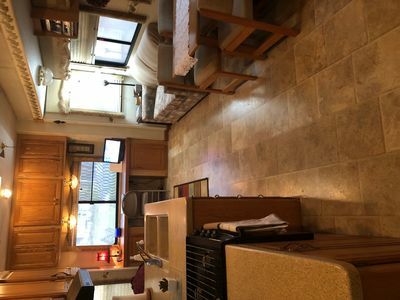 It comes with a king size bed (memory foam mattress), microwave, minifridge, coffeepot, 2 stove tops, toaster oven, pots, pans, and dishes, washer and dryer (under covered patio). Close to malls, running trails, public city park, museum, airport, expressway, hospitals, shopping, dinning, public pool, public transit, etc. Walking to or from your space you will find, fresh organic figs, guavas, peaches, and grapes...help yourself. 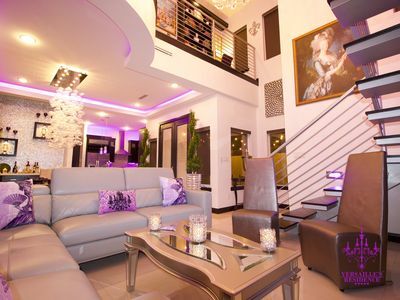 Napoléon’s Residence ™ is a Luxurious 3 Story Modern Penthouse Suite with Newly Renovated Interiors. It's a Fully Furnished Property Located in North McAllen within walking distance to Up Scale Shops, Restaurants, HEB, & Bus Stop. Its Perfect for Business Travelers, Families, Couples, & Large Groups. (?????) 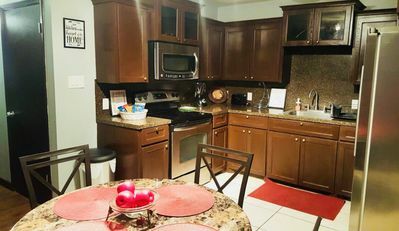 • Included Amenities: Wifi, TV, Coffee, Washer, Dryer, Shampoo, Conditioner, Hand Soap, Toilet Paper, Fresh Clean Towels, Fully Integrated Kitchen with Silverware, Glassware, & Appliances. THE SPACE Totaling 4,172 Sq. Ft., Napoléon’s Residence ™ is an Immense Place that has 3 Captivating Floors, 2 Private Rooms, Private Indoor Garage & a Balcony/Terrace that Makes it a Fascinating and Unique Place to Stay. Each Floor is composed of a Theme.... • 1st Floor: The Theme of the First Floor is "The City" where you can Find Wall Art Decor Composed of Chic Buildings & Abstract Art. • 2nd Floor: The Theme of the Second Floor is "Napoléon's Study". 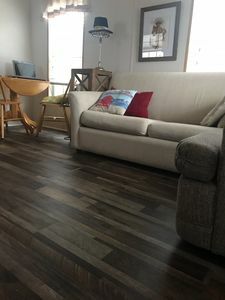 Enjoy this Amazing Floor with an "Intelectual" Atmosphere to Read a Book, or take a Nice Nap in its Super Comfortable Vita Chocolate Accent Chaise. Its also where you will find the 2 Private Rooms and where that Red Sofa turns into a Comfy Sofa Bed. Don't Forget to take a selfi with Napoléon Himself! • 3rd Floor: The Theme here is "The Cinema Room", which also tuns into a bedroom with another Comfy Sofa Bed. You Can Definitively Do Netflix & Chill Here. Just Sit back, Relax & Enjoy the Show.. Don't Forget the Popcorn!... • Balcony/Terrace: (Located on 3rd Floor Cinema) Just as you open the Doors and you will Encounter Yourself on this Incredible Breathtaking Balcony/Terrace that Overlooks all other Properties Around. Listen to the Birds. Watch Beautiful Sunsets & Sunrises. Feel the Wind Hitting your Body all Around. Feel the Tranquility & Peacefulness that makes this place just Incredible! 4 Bedrooms, 3 Bathrooms, Sleeps 8. 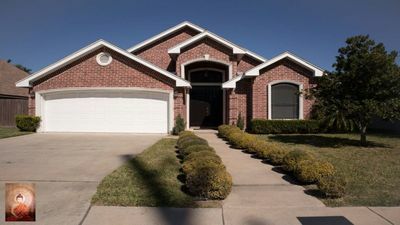 Our 4-bedroom, 3-bath Single level home is located in quiet, beautiful North McAllen in a desirable cul-de-sac neighborhood with gorgeous mature trees. You’ll love the home’s backyard area with heated private swimming pool, hot tub and large patio, all within a high brick wall for privacy. This beautiful home is minutes away from awesome restaurants, parks, theaters and the airport. 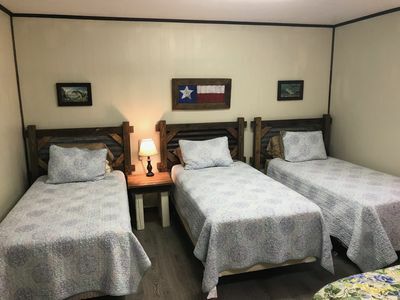 All 4 bedrooms have new (in 2019) beds, mattresses and bedding, perfect for adults and/or multiple couples traveling together. The indulgent master bedroom has a new 'Purple2' king sized bed, a large Samsung TV and private access to the pool and a bistro patio table to enjoy your coffee and sweet bread concha every sunny morning. The master en-suite bathroom includes a large vanity with 2 sinks, comfortable walk-in shower and a large jetted bathtub. Plenty of closet and drawer space is available for your clothing, storage and luggage needs. The second and third bedrooms each have new queen sized beds, nightstands and dressers separated by a shared bathroom with large vanity, 2 sinks and a shower tub. Bedroom #4 has a new queen bed and is located across the hall from its own bathroom complete with walk-in shower. The home boasts dual living areas. Both are extra comfy and ready for your group of up to 8 people. In the main living area, you'll find a plush sectional sofa and two accent chairs under 12 foot ceilings with a beautiful view of the outside patio and pool. It's also close to the dining room with table and chairs for 8; A perfect setting to enjoy a nice visit after a meal. The second living area features a large sectional with huge ottoman, 65" Samsung TV and lots of natural light. Fully equipped kitchen includes stainless appliances and lots of granite counter space. Breakfast nook has a table and 4 chairs plus 2 bar stools, ideal for gathering around while meals are being made. Our favorite place is the private backyard patio and pool area. Settle in for conversation or naps on the outdoor furniture. 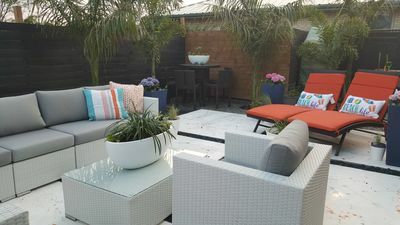 Various lounge chairs plus a large patio table with chairs and a BBQ grill provides space for dining outside. Versaille’s Residence ™ is a Luxurious 2 Story Contemporary 18th Century Inspired French Home with Newly Renovated Interiors. 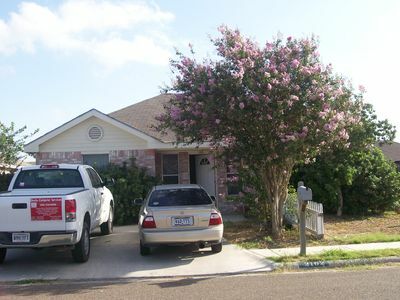 It is a Fully Furnished Property Located in the North McAllen Upscale Area. It is Perfect for Couples, Honeymoon Getaways, Anniversaries, Business Travelers, & Families. (?????) • Included Amenities: Wifi, TV, Cable, Coffee, Tea, Shampoo, Conditioner, Hand Soap, Toilet Paper, Fresh Clean Towels, Fully Integrated Kitchen with Silverware, Glassware, & Appliances. THE SPACE Totaling 2,011 Sq. Ft., Versaille's Residence ™ is a Super Luxurious French Themed Property that has 2 Captivating Floors, 2 Private Rooms, 2.5 Baths, Private Indoor Garage, Balcony and a fully Assembled Gourmet Kitchen. It also has a Stunningly Beautiful Outdoor Backyard Patio which has a Lighted Ceiling that will just make any Occasion just Picture Perfect! Its just a Fascinating and Unique Place to Stay! You will feel that you are back in 18th Century Versailles France! • 1st Floor: You will find the Fully Gourmet Assembled Kitchen that includes all of the Silverware, Glassware, and Brand New Appliances. You will also find the Extravagantly Beautiful Dining Room and Living Room Areas! In addition to that, you will also find the Uniquely Romantic Outdoor Patio to Celebrate Any Special Occasion with that Special Someone! • 2nd Floor: As soon as you climb the Stairs, you will encounter a very comfortable Purple Bench, as well as a Fancy Bookcase with a work Desktop right to the side of it. In addition to that, you will also find the Queen Fleur-De-Lis Room. Very Comfy and Spacious Room that comes with a Bell Next to the Bed Incase you Need to Call Someone up for service ;). Furthermore, you will also find The Vintage Master Bedroom. This Incredible Room is Super Spacious to just Relax and get a Good Rest. This Room comes with Incredible Purple Lighting that will just make any Occasion Extra Perfect! Walk into the Master Bedroom and you will Encounter a Beautiful Jacuzzi and a Frameless Glass Shower. Turn off all the lights and Enjoy The Elegant Purple lighting in the Master Bath as well. Walk In Closet in the Master Bathroom is Incredible too! Finally, both Rooms are Connected to a Very Specious Balcony/Terrace. Bring your Coffee Up in the Morning to this Balcony/Terrace to enjoy your view! NEW-Historic McAllen Townhome w/ Pool and Patio! 1100 sqft of private Townhouse, with pool access in a gated community. Welcome! 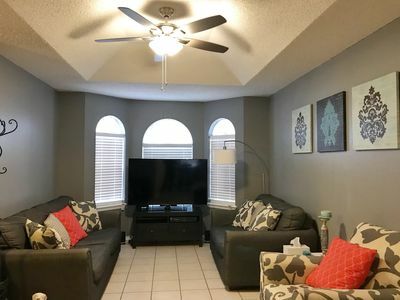 This condo is located in Edinburg, 10-15 minutes away from restaurants and other major Edinburg amenities including UTRGV. This home is in a very quiet neighborhood and is perfect for a weekend of shopping or business trips. Fully furnished private master bedroom,with attached master bathroom and a second bedroom with queen bed, a fully furnished kitchen, and laundry room. You will also have access to onsite pool as well. Charming South Texas home with Mexican Flair! 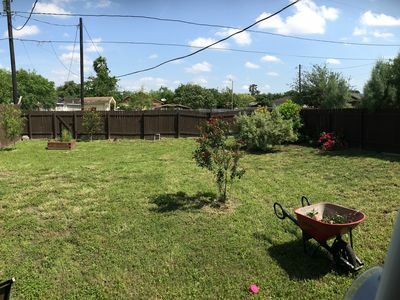 This highly rated 2 bedroom, 2 bathroom house is 1 mile from the University of Texas Rio Grande Valley and the UTRGV school of medicine and 2 blocks from downtown Edinburg. The house features a fully equipped kitchen; pillow-top mattresses; down pillows; down comforters; 45 and 65 inch LG smart TVs. The bedrooms are split with a front guest bedroom and rear master bedroom. Outdoors features front and rear fenced yards (pets are welcome) plus gardens and decks. 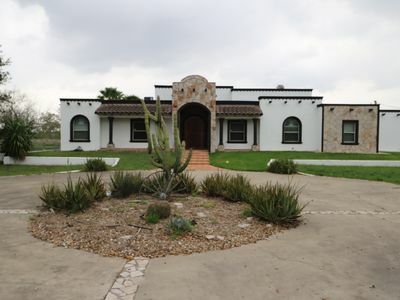 Get out of the city and enjoy country life to its fullest in a Truly Mexican Style Guest ranch painted in pastel colors. You will feel as if you are in Guanajuato Mexico in this gorgeous mexican style home located just out of the edinburg city limits. The home sits on 18 acres of land. It has 4 beautifully decorated bedrooms each painted in tasteful pastel colors. The master suite has a luxurious king sized bed with an enormous walk in closet jetted bath tub and tiled shower with his and her sinks. The second third and fourth bedrooms each have queen sized beds. You will love the kitchen with the most modern and luxurious amenities like the gas jenn air oven and stove, stainless steel appliances and granite countertops with an island. Here you will find everything to prepare your own snack or meal. You will enjoy the party room has a full sized pool table and bar. The living room has a large flat screen led HDTV and comfortable seating for everyone. Of course you will want to spend a ton of time in the back yard with your own large swimming pool fully equiped with a water slide and bridge. Here you can barbeque hamburgers or fajitas and enjoy them under the covered tiled picnic table. Then at night gather around for a campfire and make smores with roasted marshmellows. Cloud Nine Utopia. 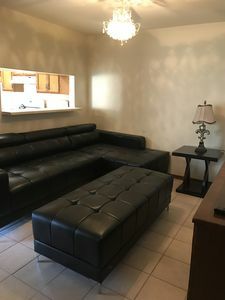 Entire Home in McAllen. SPRING BREAK SPECIAL! This Condo is a "Smart Home". 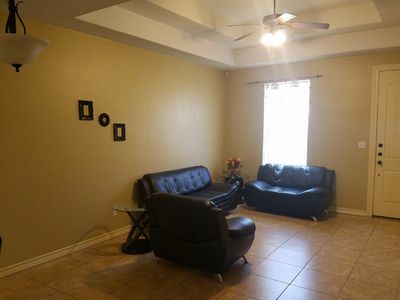 Mesmerizing Condominium Centrally located in McAllen. South of Expressway 83. A few minutes close to all McAllen's most desirable attractions (La Plaza Mall, Airport, State Farm Arena, etc). Great for a couple, family, and more. Privacy, check. Location, check. Value, check. Super clean and super safe! Location-Location-Location ~ Our home is ideally located near to most of the great features and locations McAllen has to offer! Below are amenities included with your stay: -Hi-speed WiFi -TV Downstairs with Playstation 4 -TV Upstairs with Roku TV -Computer -Pool -BBQ Grill -Gated community -Very close to stores such as Sam's Club, Costco, Golds Gym, and much more. -Plenty of parking -Laundry -Coffee and snacks -Clean sheets and towels -Less than 7 mins from the airport Book now, we guarantee you will LOVE this place! Cloud Nine Utopia, Experience the Bliss. Cozy apartment with pool, great location. Great modern 2 bedroom 1 and 1/2 baths, newly remodeled. Gated community with lockbox on front door for late check in. 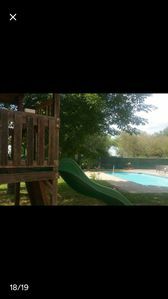 Nice and clean pool, tennis courts, BBQ pits with trees and plenty of shade and lots of green area for kids to play. 2 car port. Very close to Simon mall, airport, hospitals and theaters. 30 minute drive to Mercedes outlets and 90 minute drive to South Padre Island. My main goal is to treat my guests as I would like to be treated. 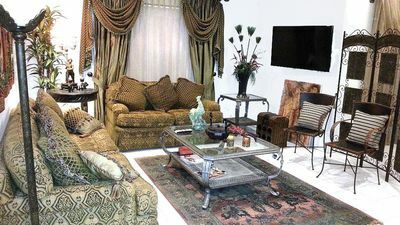 Beautifully furnished condominium in gated community in McAllen Texas, Rio Grande Valley region. 1194 sq ft bungalow, private entrance, professionally decorated, 3 bedrooms, 2 bathrooms, walk-in closet, 4 TV's, all appliances, outdoor grill, extremely clean, 2 parking stalls close to entrance. Ideal for seniors! Everything is on 1 floor. No stairs! If you want a cozy, relaxing, home away from home, then this is for you! Only 2 miles (4 minute) drive to major shopping centers. 2.5 miles to large hospital complex. 6.5 miles to international bridge crossing to Mexico. Amenities - high speed internet - 48' LED TV wall mounted in main bedroom, Directv (120+ channels) + 40 local channels including TV from Mexico, DVD player - 48' LED TV in living room, Directv (120+ channels) - 32' LED TV in bedroom 2, Directv (120+ channels) - 32' LED TV in bedroom 3, 40+ local channels including TV from Mexico Shared amenities - triple pool - larger swimming pool with 1 smaller connecting pool and jacuzzi pool - picnic benches 2 parking spots close to entrance Appliances - outdoor grill - washer - dryer - stove/oven - dishwasher - microwave oven - coffee maker - electric kettle (water boiler) - toaster - blender - ironing board and iron - hairdryer Central air conditioning + heating, ceiling fans in all bedrooms and living room. Beautiful and modern 2 bedroom, 1.5 bathroom townhouse. Amazing location for shopping and hospitals are just 5 minutes away. Walmart and Target are also less than 5 minutes away and La plaza mall is no more than 10 minute drive. Just 25 minutes to Mercedes Outlets. Gated community, we don't have carpets. Only wooden floors. There is a washer and dryer in the unit. Grill, trail for bikes or walking. Pool, tennis court, covered parking space for one car. Completely equipped kitchen for a wonderful stay. Great for families traveling with kids, couples or business travelers. Hablamos español. 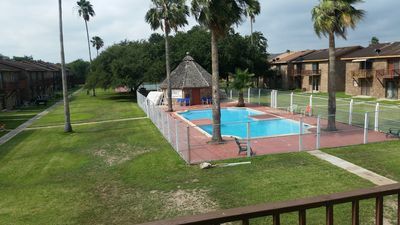 Hotel in Edinburg with free breakfast and outdoor pool Location Located in the heart of Edinburg, this hotel is 1.4 mi (2.3 km) from Los Lagos Golf Club and 2.6 mi (4.2 km) from Museum of South Texas History. 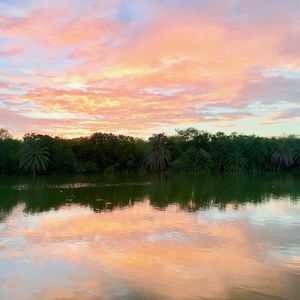 Edinburg Scenic Wetlands and Edinburg Regional Medical Center are also within 3 mi (5 km). Walking distance to IMAX multiplex and 24hr super Walmart. less than a mile from Shopping mall Property Features This hotel features an outdoor pool, a fitness center, and coffee/tea in a common area. Free continental breakfast, free WiFi in public areas, and free self parking are also provided. Other amenities include a business center, laundry facilities, and a 24-hour front desk. Room Amenities All rooms boast private pools and deep soaking tubs, while also providing free WiFi, free wired Internet, and flat-screen TVs with cable channels. Other amenities available to guests include refrigerators, microwaves, and room service. Step inside this beautiful home, where you'll be greeted with high ceilings, pillars, a recently-installed refrigerator and over the range microwave. There are large windows that let in plenty of sunshine with an overview of the pool. In the living room you are able to relax and use the free wireless internet connection to browse and or watch cable TV. In the business office you may accomplish any work while you're on vacation. Everyone in your travel group can enjoy meals together at the table in the formal dining area and or by the kitchen with a view of the pool. The spacious, fenced-in area is ideal for outdoor recreation such as a bbq and relaxing in the pool. Enjoy relaxing with a covered patio with privacy. The first master bedroom features a King size bed. The second bedroom features a Queen size bed, and the 3rd bedroom features a Full size bed with a sofa bed. 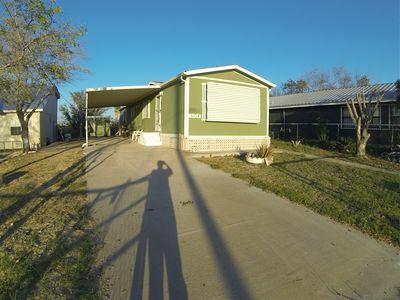 You and your guests will love this spacious 3 bedroom, 1 bath home in centrally located Alamo, Texas. The Sanchez Home provides all the privacy and amenities needed to host you, a family or small group while in town. The kitchen and bathroom are well-equipped for a comfortable stay. Relax in the spacious fenced backyard or throw burgers on the grill to be enjoyed at the patio table. ABOUT THE HOUSE Sink into the plush sofas with seating for up to six, catching up on your favorite shows through Hulu on the large SmartTV. Prepare meals in the well-equipped kitchen and enjoy family-style dinners at a table for four. Other amenities include a washer/dryer and parking for three cars. Down the hall from the main living area, you’ll find three bedrooms- one features a queen bed, the second bedroom has a full bed and the third bedroom has an IKEA sofa that makes into a floor bed. A shared bathroom offers a shower/tub combination. Throw some burgers on the propane grill and enjoy your cookout on the charming patio table for two. Please note, we do not monitor propane levels, you may have to refill the propane tank if you’d like to grill. You’re just a short 15 minute drive from your pick of restaurants, bars, and shopping in lively McAllen, Texas. We re located less than a mile away from a large city park and sports complex where you can go for your morning walk. We're centrally located between McAllen and Weslaco. Some popular destinations from us include: Alamo Community Park: 2 min (.7 mi) La Plaza Mall: 19 min (11.5 mi) Reynosa International Bridge: 21 min (12.2 mi) Progreso International Bridge: 27 min (17.8 mi) McAllen Internatioanl Airport: 18 min (12.0 mi) McAllen Medical Center: 16 min (10.7 mi) UTRGV: 22 min (15.4 mi) The neighborhood is a typical Valley neighborhood with mixed housing. Down this small street, you’ll find brick homes, mobile homes, and wood frame homes. We offer in-home massage therapy. Larissa is an exceptional and local massage therapist. Our guests receive a discount off a one hour in-home massage ($70/hour). We are happy to set up an appointment for you! Some things to note-- There is a surveillance system and a security lock on the fence. SmartTV has Hulu, Netflix and other apps that you can connect your accounts to - No Cable. RENTAL RULES We love that we can share our home with you but please treat the space and belongings with care. 1. Smoking is allowed outside only. $500USD fine if guests are found to be smoking indoors. 2. No visitors. Only those set forth on the reservation are allowed on the property at any given time. Limit of 6 people. 3. The property is privately owned; the owners are not responsible for any accidents, injuries or illness that occurs while on the premises or its facilities. The Homeowners are not responsible for the loss of personal belongings or valuables of the guest. By accepting this reservation, it is agreed that all guests are expressly assuming the risk of any harm arising from their use of the premises or others whom they invite to use the premise. 4. Keep the property and all furnishings in good order. 5. Only use appliances for their intended uses. 6. Housekeeping: There is no daily housekeeping service. While linens and bath towels are included in the unit, daily maid service is not included in the rental rate. We do not permit towels or linens to be taken from the units. 7. Do not flush anything other than toilet paper. No feminine products should be flushed at any time. If it is found that feminine or other products have been flushed and clog the septic system, you could be charged damages of up to $1000USD. 8. Storms: If there is a storm or hurricane, no refunds will be given unless: • The state or local authorities order mandatory evacuations in a "Tropical Storm/Hurricane Warning area" and/or • A "mandatory evacuation order has been given for the Tropical Storm/Hurricane Warning" area of residence of a vacationing guest. • The day that the authorities order a mandatory evacuation order in a "Tropical Storm/Hurricane Warning," area, we will refund: -Any unused portion of rent from a guest currently registered; -Any unused portion of rent from a guest that is scheduled to arrive, and wants to shorten the stay, to come in after the Hurricane Warning is lifted; and -Any advance rents collected or deposited for a reservation that is scheduled to arrive during the "Hurricane Warning" period. 9. No illegal substances are to be used, sold, or distributed on the property. 11. No parties and/or loud music. 12. Please respect the neighbors and their privacy. 13. Please lock the gate every time you leave. 14. No pets allowed. $250 fee if it is found that pets have been on the property. Donna Oasis Retreat ?? Nicely Furnished, wheelchair-friendly. 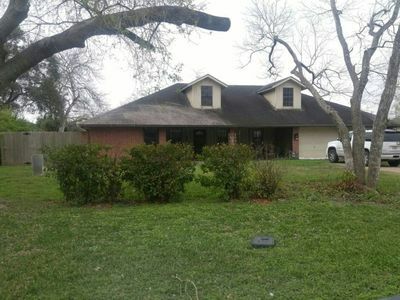 3br/3.5bath/2car Home sitting on half acre lot in quiet location, away from traffic noise, waiting to accommodate you and your family on your vacation. This house has been maintained in optimum condition. There are more than 10 mature trees/palm trees and lots of flowers all around the property. Two master bedrooms each have their private full bathroom. The third bedroom has its bathroom Just outside the door - In the hallway. 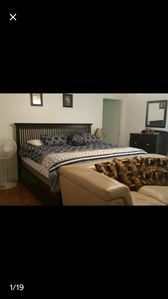 Wheelchair accessible all throughout the house and in one of the master bedrooms.. Close to the Weslaco country club, and 15 min drive to the McAllen and Mission country clubs as well as the Mercedes Outlest. For an additional low/reasonable fee, Property owner can assign you and your family a private chef to cook your desired meals, as well as a driver and luxury vehicle to transport you and your party anywhere you wish. Please discuss this service with property owner in advance. Hope to meet you in your next vacation to the Rio Grande Valley. Gated Victoria Palms Resort home, over 55. Pool, courts, activities scheduled. The Cottage in beautifully landscaped Palm tree lane, at Victoria Palms Resort is designed for efficiency with one bedroom, one bath, vaulted ceiling, AC, patio, new hardwood flooring throughout. Gas stove, microwave, completely furnished, queen bed, sofa sleeper. Cable TV and WIFI are provided. Two bicycles are available to use. It is conveniently Located near swimming pools, spa hot tubs, workout room, library, activity center for dances and arts, courts, restaurant and meeting rooms. It is a 50 minute drive to South Padre Island, 15 minute drive to Progresso, Mexico, 20 minute drive to Harlegin airport. The gated community of Victoria Palms is a resort that includes RV's , manufactured homes and Park Model homes designed for an easy, active lifestyle. The safety features include key access gates, perimeter fencing, 24-hour gate service, wide paved streets and bright illumination of over 2,000 beautifully landscaped palm trees, flowers and bushes. King Suite With Access to a Pool, a Hot Tub, and a Fitness Centre! Our deluxe suites are especially spacious! This 525 sq ft. suite with 1 BEDROOM sleeps up to 3 people and features a king-sized bed and a spacious walk-in closet. There is an additional sofa bed in the living area. Prepare for your day in the FULL BATHROOM that includes a hairdryer and toiletries. 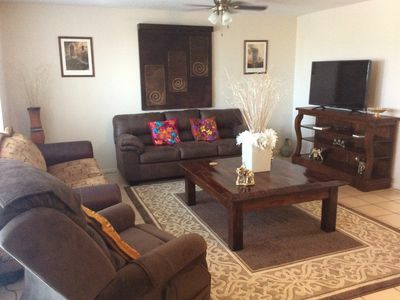 Relax in the LIVING AREA, equipped with a cable TV with premium channels and a DVD player. Get an outfit ready using the iron/ironing board, and keep your valuables protected using the in-suite safe. Make a quick meal in your KITCHEN that includes a fridge, a coffee maker and a microwave. During your stay enjoy great onsite RESORT AMENITIES including a hot tub, a heated pool, a fitness centre, and continental breakfast. Please let us know if you'd like to bring your furry best friend along, and we'll do our best to accommodate your pet for a small one time fee. Pets must be less than 20lbs. The most unique feature of our rental is its close proximity to Mexico! A short 20-minute drive will take you to the Nuevo Progreso crossing where you can go for an easy stroll over a bridge and find yourself amidst Mexican restaurants, shops, and entertainment! When you're in Texas, we recommend grabbing a coffee and a pastry at Weslaco's Daily Grind, just a 5-minute drive away. 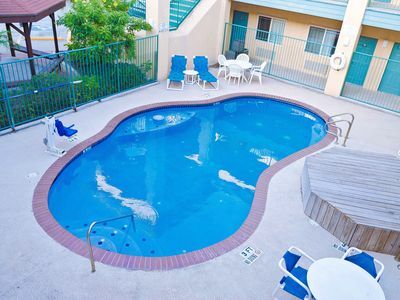 Indulge in resort-like lodging at Victoria Palms Inn & Suites. Enveloped by 2,700 swaying palm trees. Our friendly Texas hotel boasts a heated outdoor pool, hot tub, a casual restaurant (seasonal), and meeting space. Start the day with a hot continental breakfast, complimentary for standard guests, and stay connected with free Wi-Fi. Settle in to our classic rooms and well-appointed suites with full kitchens. Stay a day, a week, a month, or a year! Winter Texans area always welcomed! Double Suite With Access to a Pool, a Hot Tub, and a Fitness Centre! Our rental is located just a short 20-minute drive to the Nuevo Progreso crossing, the best place to cross into Mexico from South Texas. • 2 cozy double beds in the bedroom • Sofa bed for additional guests • FREE breakfast! • Shared hot tub • Heated outdoor pool • Weslaco's Daily Grind is just a 7-minute drive • Milano's Italian Restaurant is just a 15-minute walk away! • 10-minute drive to one of the popular and sacred sites in North America, Basilica Of Our Lady of San Juan del Valle Our deluxe suites are especially spacious! This 525 sq ft. suite with 1 BEDROOM sleeps up to 4 people and features 2 double beds and a spacious walk-in closet. There is an additional sofa bed in the living area. Prepare for your day in the FULL BATHROOM that includes a hairdryer and toiletries. Relax in the LIVING AREA, equipped with a cable TV with premium channels and a DVD player. Get an outfit ready using the iron/ironing board, and keep your valuables protected using the in-suite safe. Make a quick meal in your KITCHEN that includes a coffee maker and a microwave. During your stay enjoy great onsite RESORT AMENITIES including a hot tub, a heated pool, a fitness centre, and continental breakfast. Please let us know if you'd like to bring your furry best friend along, and we'll do our best to accommodate your pet for a small one time fee. Pets must be less than 20lbs. The most unique feature of our rental is its close proximity to Mexico! A short 20-minute drive will take you to the Nuevo Progreso crossing where you can go for an easy stroll over a bridge and find yourself amidst Mexican restaurants, shops, and entertainment! When you're in Texas, we recommend grabbing a coffee and a pastry at Weslaco's Daily Grind, just a 5-minute drive away. 31 ft. 1 bedroom with double bed, 1 bathroom, shower, fold out sofa and table make beds, A/C and heat. Perfect for single person or couple. Located in over 55 gated community with lots of amenities. Heated swimming pool, hot tub, billiards room, exercise room, showers, horseshoe area and shuffleboard court. Lots of scheduled activities. Happy hour from 3-4:30pm weekdays with beer and wine sales and live entertainment. Saturday night dances with popular area bands. Sunday morning church services. Bingo, various card games, exercise classes, water exercise, quilting, Yarn N Yak and hamburger Wednesday’s. Short drive to shopping and restaurants. Stove, refrigerator and microwave included if you want to fix your own meals. 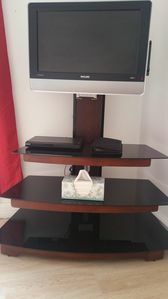 TV with local channels, DVD player. Free WiFi in the main recreation hall. All this and less than 1 hour to South Padre Island! The Enchanted Snowbird! 45 min to S.Padre Island! Heated pool! Old ancestrial two bedroom family home. Four generations old property. Located two blocks from main expressway off of main Texas street road in small town of about 1500 persons. Located right next to an elementary school & The Rio lGrande Balley Livestrock sthow graound, Five minutes from the Rio Grande VAlley premium outlet mall, Chili's , whataburger restaurant and other coffee shops and restaurants located in center of Out let mall. Sixty five miles from South Paqder ISland, Texas and 60 miles from Brownsville, Texas. Mercedes is located in the center or mid Valley of the Rio Grande VAlley. Two Airports are in close distance from the home. McAllen miller International Airport in McAllen, Texas is thirty-five minutes to the west of Mercedes and Harlingen Airtport in Harlingen, Texas is twenty-one minutes away east of Mercedes, Tx. Other restaurants located in Mercedes are Pizza Hut, lDairy Queen, Subwqay, Stars, Papa Joe's and other similar little hole in the wall dinners. There is also an HEB grocery store located two blocks from the expressway and a laundry matt. Located on a peaceful lake nature reserve, enter into a world of beauty when you walk through the door. A twenty foot expanse of windows overlooks Moon Lake and our private dock. There are no homes across the water, ensuring complete privacy. A large and bright open concept living room and kitchen with terra cotta tile floors embrace gatherings. There is a large HD television in the living area, but who needs a television when one has the beauty of nature outside the doors! The space A wall of windows welcome you to the immense master bedroom (20'x36') with a king size bed and sitting area. Private en suite bathroom in the master bedroom. The second bedroom has a queen size bed and en suite as well. The third bedroom has a twin bed and office space, and is attached to the master bedroom. The hallway just off the kitchen has a charming and bright full bathroom. The home is decorated colorfully, reminding one of the culture in nearby Mexico. The turquoise kitchen has an island that seats 3, and a dining table can accommodate another 4-5 guests. The living room is bright, with colorful Mexican blankets draping the furniture. Relax and unwind in your comfy and relaxing vacation surroundings. The home has a private 10'x12' dock. Spend time relaxing, fishing, kayaking, or taking in nature and the abundance of migratory birds in the winter. The morning sunrises are spectacular! A kayak, as well as three bicycles to ride throughout the neighborhood are also provided. The separate guest cottage across the lawn has large windows and it's own private terrace overlooking the lake! There are two twin beds, a mini fridge and small kitchen sink. A microwave allows guests to prepare snacks, and a coffee maker to enjoy morning coffee on the cottage terrace. A large HD television with DVD player is provided for movies or late night television. There is a full bathroom with shower in the cottage so one has complete independence from the main home. Perfect for those who may have friends or family visiting while you enjoy your stay. The home is 1,900 square feet with a separate 400 square foot guest cottage. PLEASE NOTE: As the home is on the water, our insurance prohibits having children. Guest access The home is yours! Access to the main home and guest cottage. Keyless, number coded locks so there is no need to worry about losing the keys. New large washer and dryer for your use, and all kitchen utensils. There is a new dishwasher making it easy to clean up. On the Water! Progreso Lakes Home with Guest Cottage. Located on a peaceful lake nature reserve, enter into a world of beauty when you walk through the door. A twenty foot expanse of windows overlooks Moon Lake and our private dock. There are no homes across the water, ensuring complete privacy. A large and bright open concept living room and kitchen with terra cotta tile floors embrace gatherings. There is a large HD television in the living area, but who needs a television when one has the beauty of nature outside the doors! The space A wall of windows welcome you to the immense master bedroom (20'x36') with a king size bed and two futon sofas in the sitting area to accommodate grandkids. Private en suite bathroom in the master bedroom. The second bedroom has a queen size bed and en suite as well. The third bedroom is perfect for a child as it has a twin bed and is attached to the master bedroom. The hallway just off the kitchen has a charming and bright full bathroom. The home is decorated colorfully, reminding one of the culture in nearby Mexico. The turquoise kitchen has an island that seats 3, and a dining table can accommodate another 4-5 guests. The living room is bright, with colorful Mexican blankets draping the furniture. Relax and unwind in your comfy and relaxing vacation surroundings. The home has a private 10'x12' dock. Spend time relaxing, fishing, kayaking, or taking in nature and the abundance of migratory birds in the winter. The morning sunrises are spectacular! A kayak, as well as three bicycles to ride throughout the neighborhood are also provided. The separate guest cottage across the lawn has large windows and it's own private terrace overlooking the lake! There are two twin beds, a mini fridge and small kitchen sink. A microwave allows guests to prepare snacks, and a coffee maker to enjoy morning coffee on the cottage terrace. A large HD television with DVD player is provided for movies or late night television. There is a full bathroom with shower in the cottage so one has complete independence from the main home. Perfect for those who may have friends or family visiting while you enjoy your stay. The home is 1,900 square feet with a separate 400 square foot guest cottage. Guest access The home is yours! Access to the main home and guest cottage. Keyless, number coded locks so there is no need to worry about losing the keys. New large washer and dryer for your use, and all kitchen utensils. There is a new dishwasher making to easy to clean up. Brick home with cedar fenced back yard. Private driveway. Quite neighborhood & neighbors. Centrally located between Brownsville and McAllen, Texas. 5 minutes from the Rio Grande Valley Premium Outlet Mall. Located in a small town of about 1500 persons. 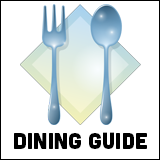 Restaurants available in town are Stars, Dairy Queen, Subway, Papa Joe's and other little hole in the wall restaurants. There's also an HEB grocery store located 2 blocks from the expressway. Lots of nature centers, bird watching and a local park two blocks away from home. The home has a laundry room with washer, dryer, washing supplies, Iron, ironing board, hampers and bucket with bbqing supplies. BBQ pit is located in the backyard along with patio furniture to sit outside in the back yard. Great neighboors that are very nice, hospitable and helpfull. the home is locateds 65 miles from South Padre Island, Texas. We also are located 7 minutes from The Rio Grande VAlley livestock show grounds, which hosts various events including the annual LiveStock show and Rodeo, Smoking on The Rio bbq cookoff competiion, Many concerts thro9ught the year, RV shows greared towards our winter visitors, Gun shows and many other events. This is a well kept 5th wheel in a great RV park. The unit is fully ready to walk in and to feel like home. 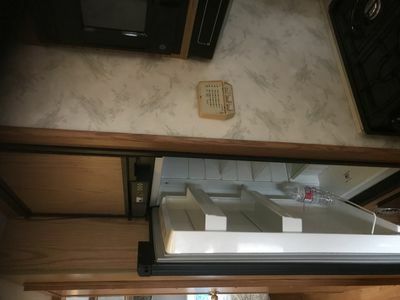 Complete with Bedding, Linens, Towels, Cookware, Dining Service for 4, Silverware and Utensils, Coffee pot, Toaster, Blender, Hot Pot, Oven/Stove top; microwave and much more. 1 bedroom with queen size bed; 1 pull out twin size hide a bed loveseat, washer and dryer. A well laid out floor plan. Located in Paradise South RV Park. 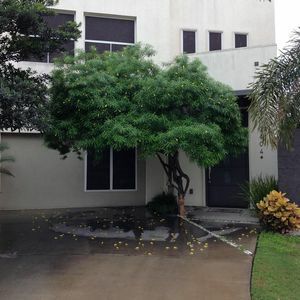 Included in the rent is garbage service, water, utilities and full use of facilities which include community center full of activities; pool and fitness center. Wifi available on daily, weekly or monthly basis by Fast Wave, and free Wifi in community room.